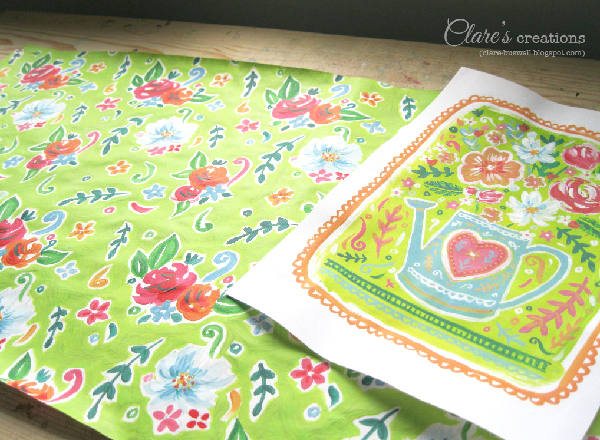 I've a new floral pattern to share today, inspired by the above illustration I did of a watering can and some florals. 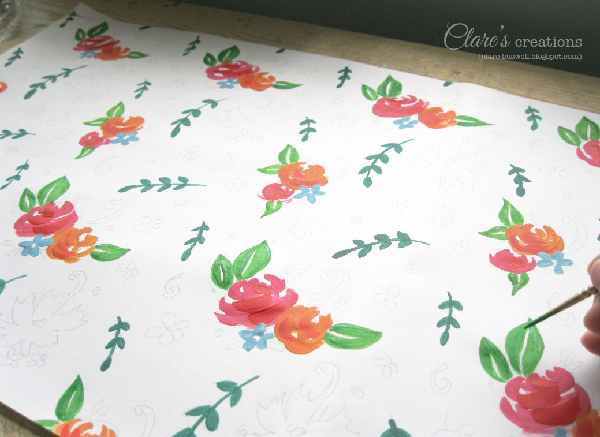 I really liked the colour combo and had a little project in mind for the finished patterned paper (more on that later!) I started out with a sketch of the repeat. Here's a link on the process. I sketched it in pencil first then went over it with a black pen so I could see it clearly for the next step. 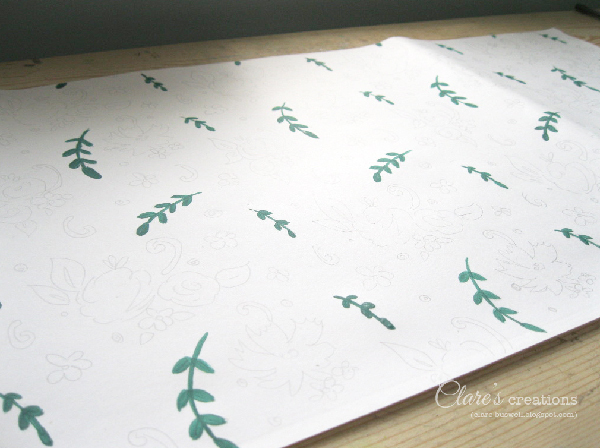 I transferred the pattern using a 2H pencil onto a really big sheet of paper (the size I wanted for my project was slightly longer than A2), I simply traced the pattern on a window because it was so big! 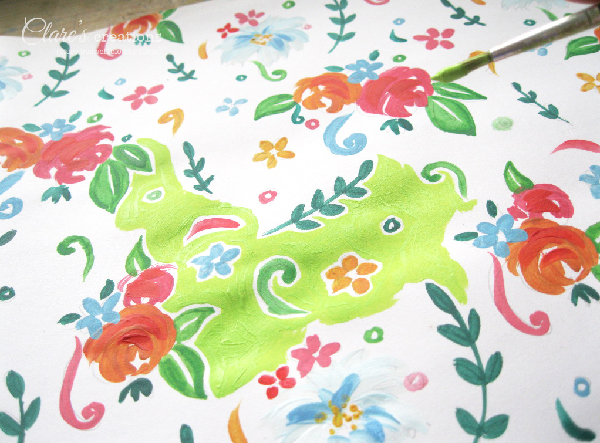 Once I had the full pattern completed, I started blocking in the different elements using acrylic paints. I used acrylics this time because I wanted a more vibrant result. I mixed all the colours I wanted to use before I started. There was a lot to fill in but once I got into the rhythm of it, it started to take shape fairly quickly! 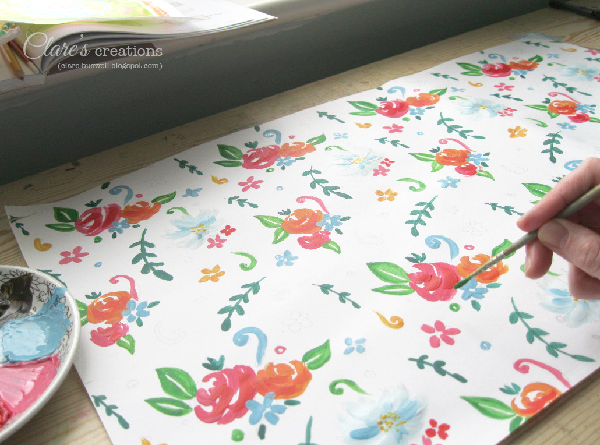 I've actually started to find the process helps you to see the pattern more and learn about how a pattern flows, so I think it's a good exercise if you're just starting to learn about pattern, like me! The shapes and forms I kept pretty simple. I wanted the pattern to be fairly loose, fluid and free. 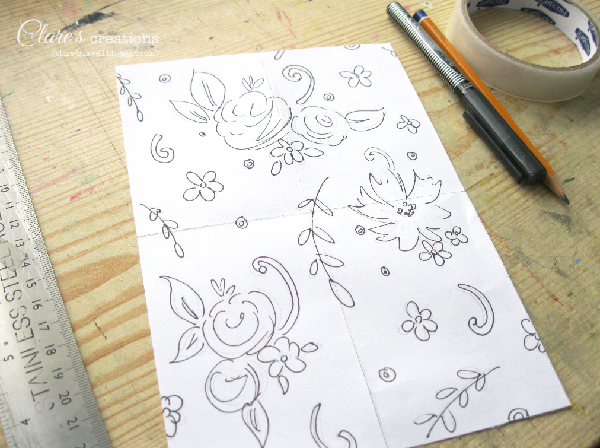 I didn't want to restrict myself too much with the original pencil sketch, so if I felt an extra flower or element was needed, I added them as I went along, of course I had to add them to every repeat in the pattern though, which again I think helped me to start seeing pattern more easily. After I had blocked in all the flowers, I was pretty happy with how the overall pattern looked and could have left it there but I wanted a coloured background so I made the scary brave decision to start colouring it in green! 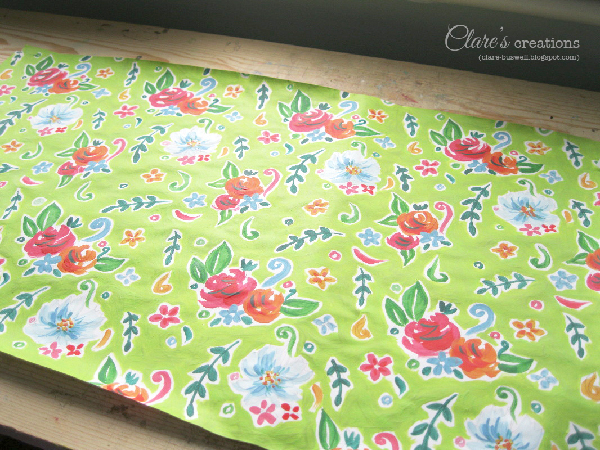 It did take a while to paint it all but it was strangely therapeutic and pretty satisfying once I'd finished it all! 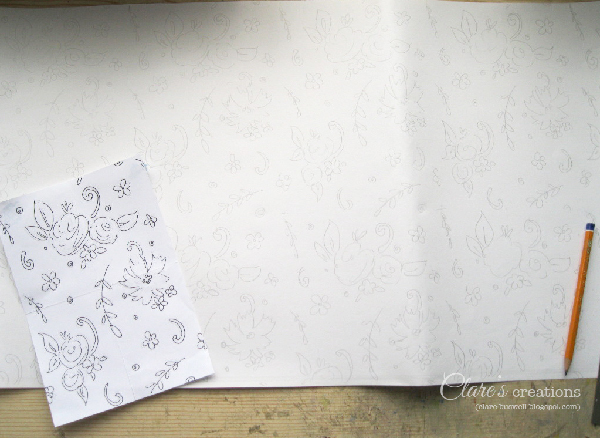 This is the completed full sheet of patterned paper! 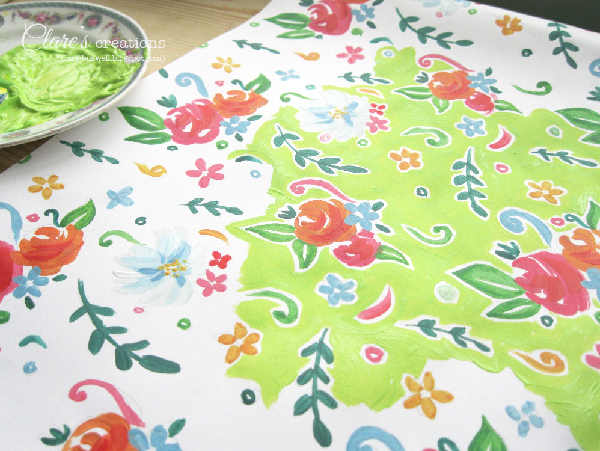 It has a really nice feel to it too, the texture of the acrylic paint makes it pretty special. 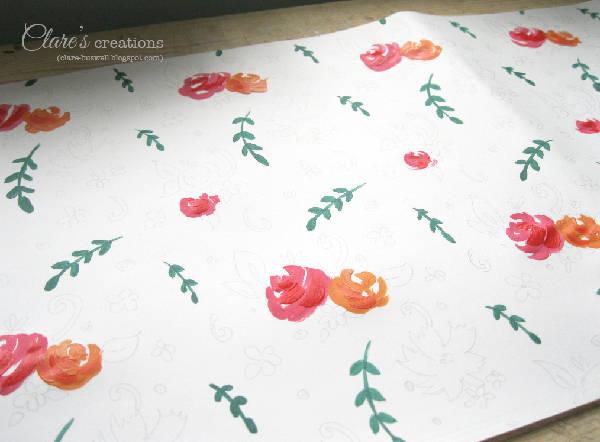 I'll be back tomorrow with another post about the project I used the patterned paper for, as well as a step-by-step tutorial! Thanks for dropping by and sorry it was so long since my last post, I've been pretty busy. If you're on Instagram, you'll see more regular posts about what I'm working on there, here's a link to my Instagram profile, it's also in my sidebar here on my blog. Oh, one more thing, if you're interested in learning more about surface pattern design, I highly recommend the book - A Field Guide to Fabric Design by Kim Kight, it's jam-packed full of information about creating patterns both by hand and on the computer. 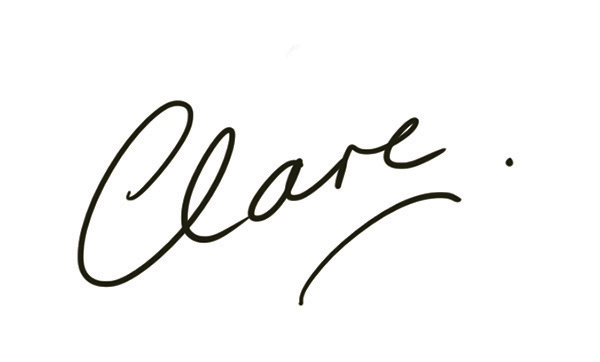 I would buy this, Clare, as a fabric or a paper! Love what you're doing; thanks for sharing the process!